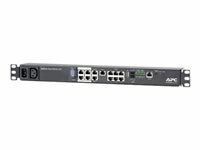 The NetBotz 250 from APC by Schneider Electric is an affordable environmental monitoring appliance for all IT environments. It protects your computing equipment from physical threats such as high temperature, humidity, fluid damage, and both malicious and unintentional access events. With native support for NetBotz wireless sensors, the NetBotz 250 allows for a rapid deployment of your environmental monitoring solution. With its shallow 19" form factor, the NetBotz 250 can be mounted in a rack alongside your other IT gear, or zero-U mounted in the back. The appliance has six on-board ports for connecting various NetBotz wired sensors, including temperature, temp/humidity, smoke, and spot fluid detection sensors, as well as third party sensors via a dry contact cable. Additional dedicated ports include a beacon port, voltage output, relay output, and Modbus connections, for monitoring the device over Modbus RTU or TCP. Thresholds, alerts, and notifications are configured through either the NetBotz 250 web UI or via StruxureWare Data Center Expert. The Data Center Expert integration is especially valuable when you need to manage multiple NetBotz appliances through a single pane of glass. For environments that do not require surveillance, the NetBotz 250 is the fastest and most affordable solution to protect IT gear from physical threats. Included with the NetBotz Rack Monitor 250 is a wireless sensor starter kit, including a Zigbee wireless network coordinator and wireless temperature sensor, in addition to a wired temp/humidity cable. This means the NetBotz 250 is ready to start protecting your IT environment within minutes. Ease of deployment - when in auto-join mode, the NetBotz wireless sensors will be automatically commissioned. Reduced cabling - wireless sensors are not saddled with high cabling costs and rigid deployments constraints. Easy Integration - Integrates with APC racks, NetBotz sensors, and Data Center Expert for easy deployment, configuration, and management. Encryption - Helps ensure effective access control and integrity for SSL browser and SSH sessions. Reduce Cabling - Features wireless sensors to reduce the clutter and expense of cabling. Flexibility and adaptability - Can be the environmental monitoring solution, or the rack access control solution, or both. The NetBotz intelligent edge architecture enables the integration of a number of monitoring devices with diverse protocols into a single management platform. Physical and environmental information can be integrated from virtually anywhere in the network, managed in a common format, and presented as actionable intelligence, providing a coordinated monitoring and response capability across an entire enterprise. The result is a predictive, preventative monitoring solution that provides the advance warning necessary to prevent small issues from becoming big disasters, while increasing uptime, product lifecycle and resource efficiency. Monitoring and controlling critical IT assets in data centers and remote locations is a key component of any preventative management strategy. Yet physical security is often a forgotten aspect of what is otherwise a comprehensive IT security plan. Customizable Input Contacts Monitor conditions from external devices. Customizable Output Relays Control output from external devices via output relay(s). Manageability Advanced View client application - Robust appliance interface provides historic alerts, graphs, and configuration.